I’ve been putting off posting about my tomato garden because I had grand dreams of collecting photos as it grew and then making a movie about it. Eh. Maybe that will still get done, but in the meantime I’m wasting good post fodder. Way back in April I started some seeds in an egg carton on the windowsill. “Welcome to hell Good luck, little seeds,” Lloyd said. Once they showed that they were going to make a go of it, I put some of the blocks out along the south side of the house. It gets a fair amount of sun out there, according to Brad. Then, determined not to spend more than the couple of bucks on seeds, I filled the spaces with compost, then a little leftover potting soil from various plants we’ve killed. 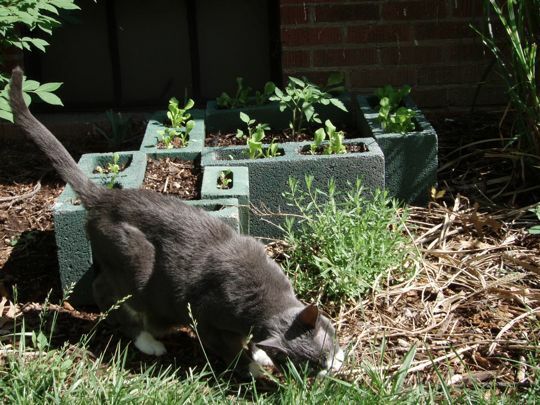 So, the two best-looking tomato plants were transplanted to the big space, and I sprinkled lettuce seeds in the spaces in the blocks themselves. It was around this time I was tinkering with the rain barrel idea (Which has run into a few snafus, Beth. I’ll have to talk about that with you. 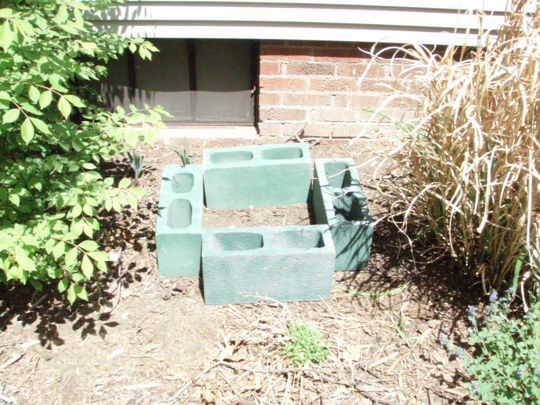 ), and thought, “Y’know, I still have several blocks yet – why not build an annex?” So, now there is a little spot to the side for cucumbers to grow, and yet more lettuce. Lloyd thinks it looks stupid. He has no heart for ingenuity, only a passion for symmetry. I realize that I’ve probably planted the cucumber seeds too late, but I don’t care. It’s all in the name of experimentation! Cricket approves of it all. You wanna borrow my rototiller to keep the weeds down? Naaaaaw, it won’t jinx it! Now we’ll all be sending happy-growing vibes to your pretty plants! What a great idea! 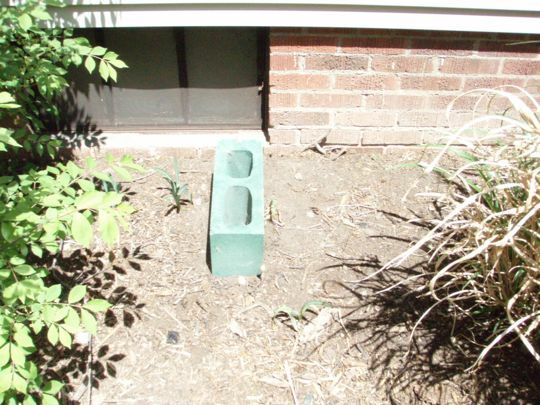 I would call your cinder block design asymmetrical. very cute. I’m surprised that Cricket didn’t request cat nip…maybe in the annex portion. It looks wonderful!! I’m very proud of you!! You are a genius!! Yikes…you’ve left me all alone in the dust of the gardening challenged. 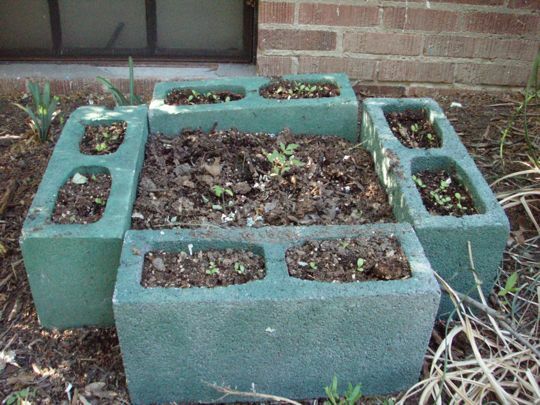 But I have a question…are you supposed to use compost when planting things? Is that what I’m doing wrong? I just used compost because we have so much. (I was too lazy to dig down to where it’s more dirt-like, as you can tell.) 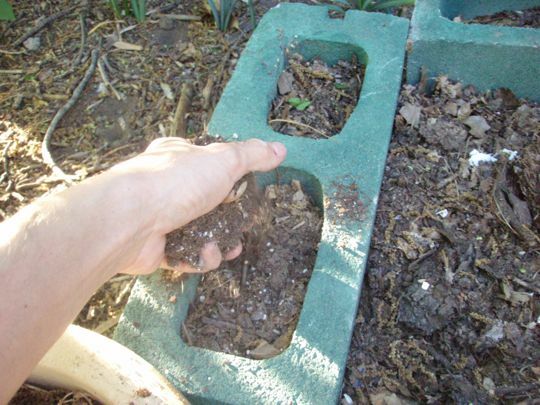 The square-foot garden pots tell you to put a mixture of compost, peat and something else, but… eh. Whatever. Your parents are SO proud! 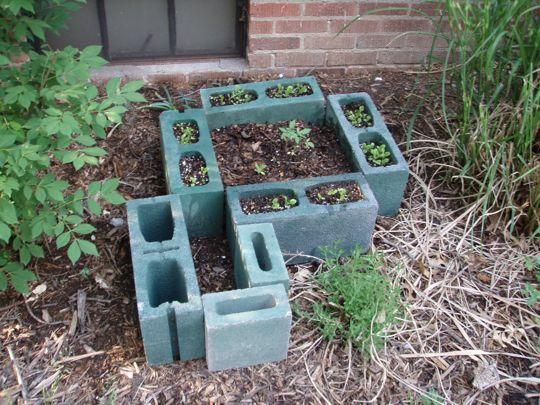 Grow little tomato plants! You can do it. Maybe we should have a race. Alaska tomato plants vs. Nebraska tomato plants. Who will win? Nobody can say…. Oh. I forgot to say that I never even LIKED tomatoes.